Considering extremism while ignoring the will of voters and the consent of the governed reflects tone-deafness and not acceptable. 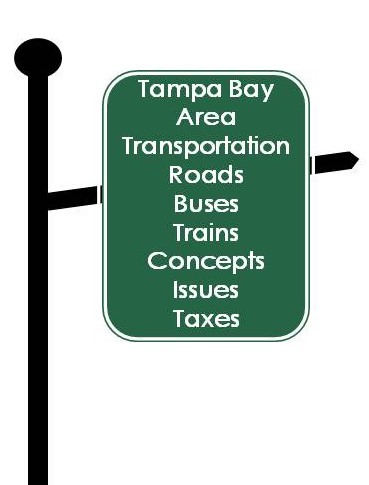 But that is what FDOT's TampaBayNext is doing. Tearing down our interstates that 200K vehicles and almost a half million people use everyday is extremism and is not an option for reducing congestion or addressing our transportation issue in Tampa Bay. FDOT made a unique outreach to transit advocates that the rest of us were not afforded. They are not representing the rest of us. How did that special outreach to extremists turnout? Not well. What did FDOT gain from spending your tax dollars on one monolithic group of people? Nothing. Because after the StopTBXers returned from their taxpayer funded St. Louis trip, they still want to demolish our interstates. Now the StopTBX extremists posted recently on Facebook they are targeting the newly named FDOT District 7 Secretary David Gwynn and plan to "unleash" on him. 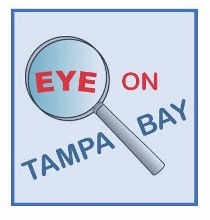 The extremists do not represent a majority of the citizenry in Tampa Bay. No matter how vocal they are or how many meetings they show up at or what the Tampa Bay Times falsely reports or ignores, we are not San Francisco Bay. TampaBayNext is creating another big mess - confirmed by the urbanists Facebook post above. TampaBayNext, which is costing taxpayers millions, is setting unrealistic expectations that can never be met. They are using misleading and inaccurate information and ignoring relevant information. Sound familiar? Moving Hillsborough Forward in 2010, Greenlight Pinellas in 2014 and the recent Go Hillsborough debacle used the same tactics. And they all have basic 3rd grade math problems. These tactics are used time and time again to ram tax hikes thru for costly transit boondoggles. Has FDOT joined in? Click the Transit link and what pops up? FDOT knows Tampa Bay wants transit options, and we’re committed to transit investment. FDOT provides no annotation or footnote for any details behind that statement. Did FDOT conduct a survey or a poll or what? When we asked FDOT how they "knew" this. The only answer provided was it is what people (we don't know who they are) have told them. Voters in Tampa Bay (Hillsborough, Pinellas and twice in Polk) overwhelmingly defeated all transit tax hike referendums - FOUR TIMES since 2010. And transit ridership is declining in Tampa Bay. FDOT needs to reword that statement. FDOT ignores declining transit ridership while vehicle miles travelled is set to be a record this year. Is that intentional? Rhetorical statements can be made but they insinuate false narratives. Even in South Florida, the densest part of the state where the Central Planners were forcing stack and pack densities (that creates more congestion), people are rejecting transit and choosing to drive or use ride-share and the sharing economy: Traffic's bad but South Florida commuters find bus, trains worse. "Planners may be pushing for more buses and trains, but South Florida’s commuters are no longer on board. The numbers reflect a national trend, but the results mean current efforts to narrow roads and focus more attention on pedestrians, bicyclists and transit riders may have to be rethought. Planners had expected that the worsening traffic situation would encourage commuters to leave their cars at home. "We’re going to have to work on roadway capacity improvements," he said. This is abject failure again by the central planners - taxpayers wasting billions on transit failures. No matter what the central planners say in Tampa Bay, South Florida is no model to follow. fare box revenues do not even cover the cost of its own ticketing system. Farebox revenue covers only 5% of its annual operating costs forcing axpayers to pick up 95% of the operating cost of this boondoggle. And Jacksonville made it's 2.5 mile elevated monorail Skyway free to riders (nothing is really free) years ago and still its ridership is dismal. After Jacksonville, Central Florida and South Florida unwisely spent billions on costly failed transit projects, they have wised up. They are now ALL expanding their interstate capacity with managed toll lanes which actually help relieve congestion. Taxpayers in Tampa Bay should not be forced to pay for more costly transit failures. In major metro areas, transit services typically attract between 5-10% of total travelers. That is a misleading and disingenuous statement. The metro areas where transit commuter ridership is greater than 5% are few including NYC, Chicago, LA, Boston, San Francisco. It is unfair and very disingenuous to compare Tampa Bay to any of those very large metropolitan areas. Transit ridership in the four largest metro areas of Florida is well BELOW 5% and transit ridership is down across the country. HART serves about 1.5% of the daily workforce (American Community Survey), or about 11,000 riders per day. Over 600,000 commuters get to work by automobile. Pretty simple math. Today almost 200K vehicles are using our interstates and will increase to about 300K vehicles by 2040. If magic suddenly occurred and transit in Tampa Bay magically took 5 - 10% of vehicles off the road, the number of new vehicles would dwarf the very overly optimistic number taken off the roads. In other words spending billions on costly fixed guideways will not reduce congestion in Tampa Bay. 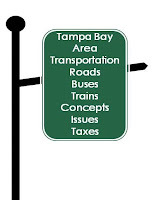 While FDOT uses data from the biggest transit LOBBYIST in the country American Public Transportation Association (APTA), where is data from our own transportation think tank at USF - Center for Urban Transportation Research (CUTR) who provides objective expertise? FDOT is shamefully ignoring CUTR's data. We posted previously this article and honest assessment from Steve Polzin, a transportation expert, Director of Mobility Policy Research at CUTR and former HART Board member. Here is a Webcast by Polzin about overall transit on March 30, 2017 and his accompanying presentation. FDOT should take note of Polzin's honest assessment. FDOT ignores that even analyzing the annual data published by lobbyist APTA, ridership on the New York City Subway accounts for all of the transit increase since 2005. On services outside the New York City subway, there was a loss of nearly 200 million riders between 2005 and 2015. And last year even New York City subway ridership FELL .8%. After voters in Tampa Bay consistently reject higher taxes for costly transit projects and trains, FDOT ignores them and created this presentation: Making Tracks - a Primer for Implementing Transit Fixed Guideway Projects. The data used is very misleading. Slide 10 of the presentation states some average costs per trip and costs per mile (not including right of way which can be huge) which are also misleading. This article Outrageously Expensive Transit reflects actual costs. FDOT fails to mention huge cost overruns and totally ignores future long term major rehab and replacement costs taxpayers get stuck paying for. Honolulu's 20 mile elevated rail has doubled in cost to $8.6 Billion and may escalate further to $10.8 Billion, over $500 MILLION per mile. Minnesota's proposed $1.858 BILLION 14.5 mile light rail is over $128 MILLION per mile. Light rail projects today more likely cost $80 to $100 MILLION per mile or more yet carry a very small percentage of commuters and overall travelers. Estimated capital costs for any fixed guideways in Hillsborough County in the AEComm report are all over $40 million per mile. No wonder Hillsborough County refused to publicly present this report….. Slides 12 and 13 indicate rail projects "can" get 50-80% of the capital costs from the Feds. However, federal (or state) funding requires a local match for capital costs and a long term committed funding source for operations and maintenance into perpetuity. What state legislator is going to force another CSX/SunRail boondoggle on us? Taking federal transit dollars has all kinds of strings attached which raises the cost. When the project goes financially south or bankrupt like the Tampa Streetcar, it's impossible to shut the fiscal disaster down. Taking federal transit money is like Hotel California - you can check in but can never check out. Costly rail is not about mobility, it's about land use to benefit special interests. All these initiatives are about fleecing taxpayers for more money. More taxpayer money - that's why FDOT funded the $1.5 million Regional Premium Transit campaign before they ever launched TampaBayNext. The transit propaganda machine is in full force again because the rail cartel thinks we are stupid. Others must think we are stupid too. According to this recent Times article, some of the electeds who want more taxpayer funded transit (even as ridership tanks) tell us their schedules are too busy to take the bus. Hillsborough County Commissioner Pat Kemp said taking the bus isn't possible with all the meetings she attends. "I would like to ride transit more if I wasn't so busy working on the transit issue. ... It's not very amenable to my kind of schedule. I'm not an 8-to-5 in one place type of person." Hillsborough County Commissioner and HART chair Les Miller said his busy schedule makes it "awfully difficult to jump on the bus." Transit for thee but not me…and how out of touch with reality. The reality is the rest of us have very busy schedules and that's why we prefer to drive too. During the course of a day we meet clients, drop kids off at school or daycare, go to work, run errands during lunch, go to doctor appointments, pick up kids, take them to after school or evening activities, check in on elderly parents, other responsibilities to attend to as well as civic, social or recreational activities. Who has a simple 8 to 5 schedule these days? Probably very few do and becoming fewer. Note that Commissioner Miller, also Chair of the Hillsborough MPO, selected all six of the transit advocates and extremists from Hillsborough who participated in FDOT's unique outreach no one else was afforded. Miller voted for the unnecessary proposed Go Hillsborough sales tax hike to fund transit boondoggles and as MPO Chair voted against TBX managed lanes. DOT officials presented seven alternatives to the downtown Tampa interchange and I-275 north to Bearss Ave. during Wednesday's meeting. None of them included toll lanes on that span of I-275 and they all had some sort of transit, such as light rail or express bus. Those concepts are versions of just one of the alternatives being considered. DOT consultant George Walton said the department also is looking at a beltway, turning I-275 north of downtown into a street-level boulevard or using reversible, elevated or sunken lanes. Light rail is toxic in Tampa Bay. Why is FDOT considering toxic solutions and extremists solutions while ignoring common sense? Because taxpayers keep enriching the same consultants who keep pushing the same failed solutions over and over and over. George Walton was previously with Parsons Brinkerhoff who gave us the Hillsborough 2010 rail tax and the crony Go Hillsborough debacle - both failures. The largest commuter population into Hillsborough is from Pasco County, a county that is growing leaps and bounds. Eliminating the interstate north of downtown is absurd and ridiculous and would cause our local streets to become more congested and more dangerous. Does FDOT want to create more safety issues? TampaBayNext is costing taxpayers millions and millions of dollars and is heading down the very same path as Greenlight Pinellas and crony Go Hillsborough. Both of those efforts were rife with dishonesty, misinformation and flat out lies. If FDOT wants to restore their credibility, the new District 7 Secretary needs to reset TampaBayNext asap by being honest and acknowledging reality. The public is fatigued of the transportation charades in Tampa Bay and tired of hokey meetings facilitated by the same people who gave us the 2010 and 2014 failed rail tax referendums. FDOT must acknowledge reality. Innovation and technology is disrupting traditional transit. FDOT must acknowledge that voters in Tampa Bay have consistently rejected higher taxes for costly transit. FDOT must acknowledge the public has spoken numerous times that roads are the highest priority. FDOT must stop being tone-deaf to reality. Get real FDOT. Get a reality check. Or TampaBayNext will fail and we all lose.